As I noted, there is a specific reason why “financial types” have a preoccupation with the balance sheet. This is why the slowdown in global growth became an important factor behind the central bank’s decision to put plans for interest rate increases on hold. That comment was made by Federal Reserve Vice Chairman Richard Clarida during a question-and-answer session last week. “The reality is that the global economy is slowing. You’ve got negative growth in Italy, Germany may just grow…1% this year, [and] a slowdown in China. These are all things that we need to factor in. As we noted previously in “Data or Markets,” the Fed is not truly just “data dependent.” They are, in many ways, co-dependent on each other. A strongly rising market allows the Fed to raise rates and reduce accommodative as higher asset prices support confidence. However, that “leeway” is quickly reduced when asset prices reverse. This has been the Fed cycle for the last 40-years. The chart below shows the correlation between the decline of GDP and the Fed Funds rate. There are two important things to notice from the chart above. The first is that prior to 1980, the trend of both economic growth and the Fed Funds rate were rising. Then, post-1980, as then Fed Chairman Paul Volker and President Ronald Reagan set out to break the back of inflation, each successive cycle of rate increases were started from a level lower than the previous cycle. The difference between the two periods was the amount of debt in the system and the shift from an expansive production and manufacturing based economy to one driven primarily by services which have a substantially lower multiplier effect. 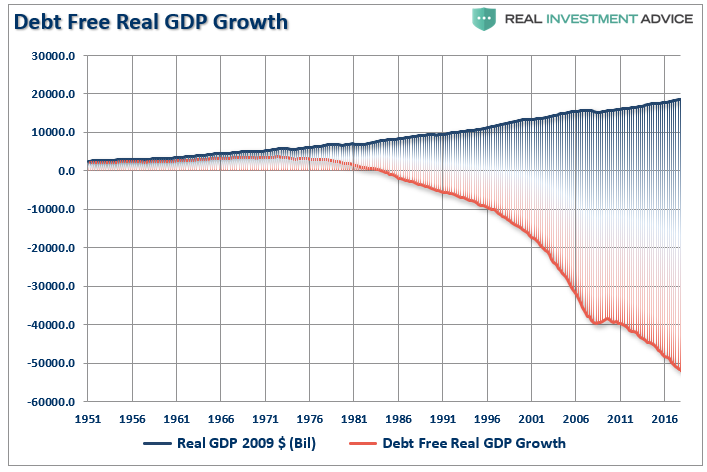 Since 1980, it has required increasing levels of debt to manufacture $1 of GDP growth. 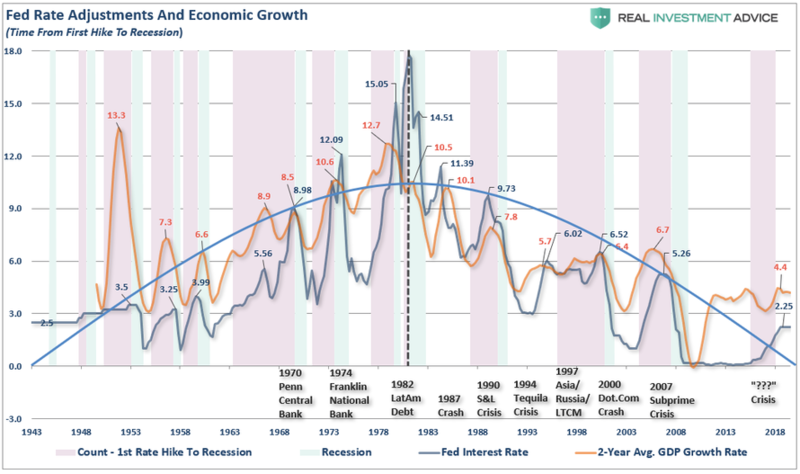 In every case, the rate cycle increase ALWAYS led to either a recession, bear market, crisis, or all three. Importantly, those events occurred not when the Fed STARTED hiking rates, but when they recognized that their tightening process was confronted by weakening economic growth. The problem for the Fed is that while lower interest rates may help spur economic growth in the short-term, the growth has come from an increasing level of debt accumulation. Therefore, the economy cannot withstand a reversal of those rates. As shown above, each successive round of rate increases was never able to achieve a rate higher than the previous peak. For example, in 2007, the Fed Funds rate was roughly 5% when the Fed started lowering rates to combat the financial crisis. Today, if the Fed started lowering rates to combat economic weakness, they would do so from less than half that previous rate. As Richard Clarida noted in his speech, one of the potential risks to Central Banks globally is the lack of monetary policy firepower available. We previously pointed out that in 2009, the Fed went to work to rescue the economy with a $915 billion balance sheet and Fed Funds at 4.2%. Today, that balance sheet remains above $4 trillion and rates are at 2.5%. It isn’t lost on the Fed that if a recession were to occur, their main lever for stimulating economic activity, interest rate reductions, will have little value. Given the amount of debt outstanding and the onerous burden of servicing it, the marginal benefit of lower rates will likely not be enough to lift the country out of a recession. In such a tough situation the next lever at their disposal is increasing their balance sheet and flooding the markets with liquidity via QE. However, even that may not be enough as both Ben Bernanke and Janet Yellen have acknowledged that they were aware that each successive round of QE was somewhat less effective than the last. That certainly must be a concern for Powell if he is called upon to re-engage QE in a recession or another economic crisis. For the Federal Reserve, they are now caught in the same “liquidity trap” that has been the history of Japan for the last three decades. One only needs to look at Japan for an understanding that QE, low-interest rate policies, and expansion of debt have done little economically. 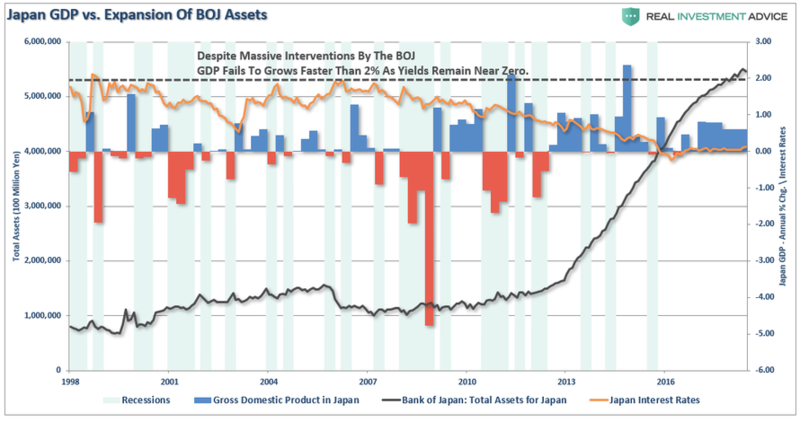 Take a look at the chart below which shows the expansion of the BOJ assets versus the growth of GDP and levels of interest rates. The real concern for investors, and individuals, is the actual economy. We are likely experiencing more than just a ‘soft patch’ currently despite the mainstream analysts’ rhetoric to the contrary. There is clearly something amiss within the economic landscape and the ongoing decline of inflationary pressures longer term is likely telling us just that. The big question for the Fed is how to get out of the ‘liquidity trap’ they have gotten themselves into without cratering the economy, and the financial markets, in the process. 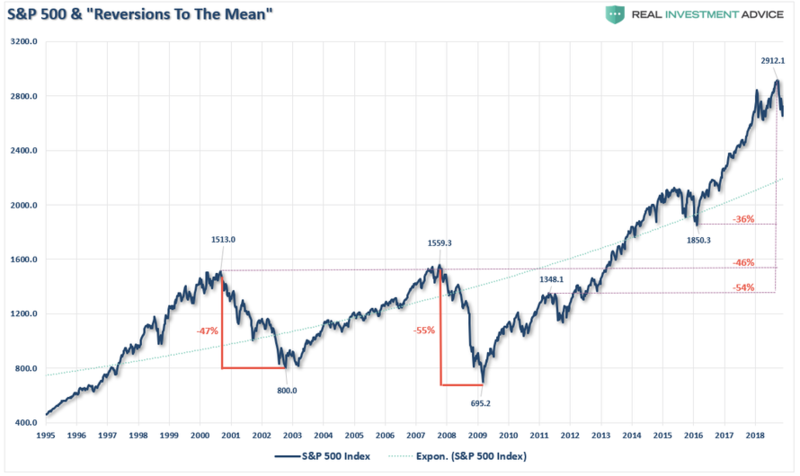 However, the one statement, which is arguably the most important for investors, is what Bill Dudley stated relative to the size of the balance sheet and it’s use a tool to stem the next decline. “It’s happened twice before in the last 20 years and with less debt, less leverage, and better-funded pension plans. 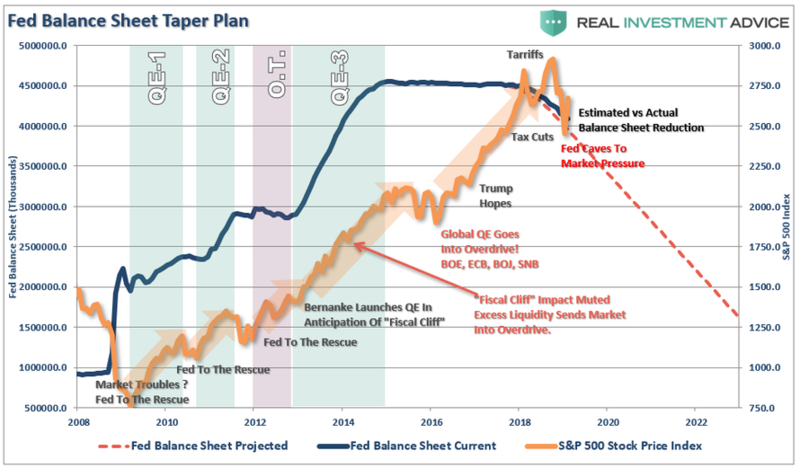 While Bill makes the point that “QE” is available as a tool, it won’t likely be used until AFTER the Fed lowers interest rates back to the zero-bound. Which means that by the time “QE” comes to the fore, the damage to investors will likely be much more severe than currently contemplated. Yes, the Fed absolutely targets the financial markets with their policies. The only question will be what “rabbit” they pull out of their hat if it doesn’t work next time? I am not sure even they know.